Attempting to escape the man, the girl walked across the street and set out down the pavement on Houseki road. As though mimicking the pistons of a train, she moved from right to left and left to right in rapid succession. A blue bus groaned to a stop. One-yen taxis lined up in a queue. She swiftly decided to return home on the government railway line. She gave up on the one-yen taxis. The train was unusually crowded, but one way or another, the girl was able to take her opera bag off of her shoulder and place it underneath her left armpit. Around Kanda station, she realized that a man standing by her left shoulder was gripping his finger, his entire face contorted in pain. Blood gushed out from the gaps in his hand. The girl, her eyebrows raised in surprise, offered the man her handkerchief. “Ah, I’m sorry. It’s just, in the door…” As he thanked the girl, the man’s blood stained her handkerchief, now wrapped around his finger. The man stood up, ready to rush out of the door, and the girl’s crocodile-leather opera bag dropped into the man’s seat. The girl gathered her bag and prepared to transfer to another line. The train’s automated doors slowly glided open. The girl, having placed her turtle in a washbasin, went into her room. She watched the turtle in the basin, waiting for it to stick out its head. She had been taught that in order to extract fresh blood from a turtle, one should wait for it to stick out its head, and then slice it with a sharp blade. She recalled the man in the train, whose finger had been cut off by the automatic doors. In a moment, this turtle would soon gush in the same way. It was unpleasant to think about. But still, the girl stood there, a large pair of sharp pruning shears in her right hand, waiting for the turtle to stick its head out. This was something she felt she couldn’t ask someone else to do. It was something the girl had to do herself. It was something she wanted to deal with in secret. Lately, the girl had begun to worry she was going to become permanently frigid. She had tried many things to combat this. For instance, she had tried trendy aphrodisiac supplements like “Essence of Youth” and “Toshika Pin.” Unfortunately, neither of those things had done the trick. But even if she was dried up like this, she hadn’t forgotten what pleasure felt like. Sure, it might be useless when the leisure class was probably already halfway to ruin, but for the sake of her own pleasure, she was going to cut this turtle with a sharp knife and slurp up all of its blood. It stuck out its head. The turtle had stuck out its head. The girl cut off its head with the pruning shears. A small white fingertip fell out of the turtle’s mouth. A delicate section of finger with the nail still attached. The girl sat on her bed with a newspaper spread out before her. On July 20th, 1929 at 7:30 PM, on the line from Sakuragi-chō to Tokyo, a man in a grey hunting cap and light brown summer jacket was arrested. A chase began for the man after he was sighted attempting to reach into an adult female’s opera bag. The suspect was finally apprehended at 4PM today by a police officer at Yūrakuchō station. It appears that the criminal, who is missing the top segment of his index finger, frequently pickpocketed unsuspecting customers on the train from Tokyo to Yokohama. Toshirō Sasaki (1900-1933) was a writer in Japan in the early 20th century. 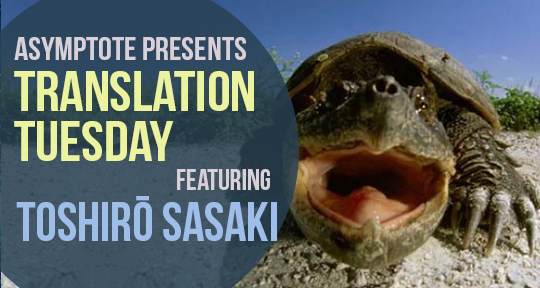 Once referred to by Nobel Prize winner Yasunari Kawabata as “the standard bearer of peasant literature,” Sasaki often wrote about the effects of rapid modernization in the wake of the rise of the Japanese empire. His famous stories include “A Town for Curiosity Hunting”, “Black Zone”, and “An Empty Land Where Bears Emerge”. Sacha Idell is a writer and translator from Northern California. His stories have appeared in Ploughshares, The New England Review, Electric Literature, and elsewhere. His other published translations include stories by the Japanese mystery writer Kyūsaku Yumeno. He is fiction editor of The Arkansas International and an MFA candidate at the University of Arkansas, where he is a Walton Fellow.